The 50-year old Carver yard is renowned for building production boats of good quality, resulting from a precise design but also from its vast experience gained in so many years of activity. 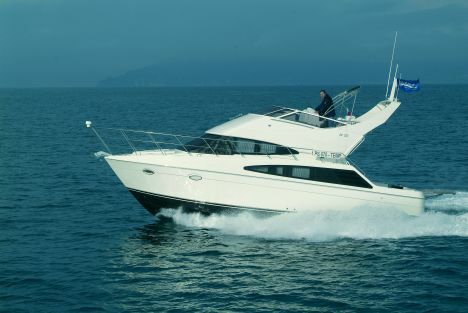 Its boats have excellent seakeeping abilities and at the same time are extremely practical like all American products. The Carver 38 is an average-sized boat nevertheless she is extremely comfortable thanks to the layout and fitting-out making her the ideal boat for a cruise as well as for deep-sea fishing. The outside line features two large windows on the sides, one of them being connected to the windshield and to the small but well organized flying bridge. 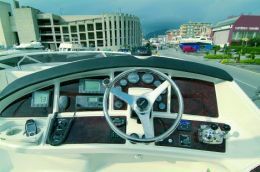 Her strength lies in the ample and spacious cockpit ideal for fishing but also for any marine activity. The sizeable swim platform is easily accessible through a port in the cockpit aft. Interiors are comfortable. The idea of raising the dinette to increase the guest cabin headroom was excellent. 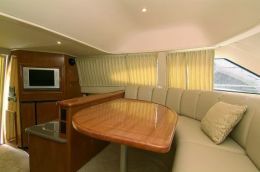 The salon, with a large sofa opposite the galley is bright and elegant and the cabins are surprisingly ample for a 38 footer. The rakish waterlines offer an excellent cruising speed with reduced fuel consumption. Notes: Owner may choose between diesel and gasoline engines; engine power from 280 to 370 hp. 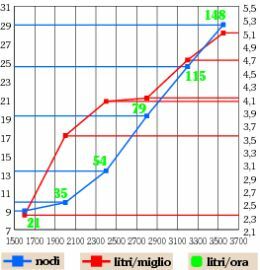 Fuel consumption indicated in the graph is supplied by builder, nevertheless effective consumption at sea may differ from published data depending on the loads and their distribution on board, on the navigating conditions, on the engines state and adjustment as well as on the characteristics of the propellers used. Hull and structures construction and material: engine bed foundation; strengthening of bottom transverses with longitudinal girders; angle steel plates support the floor aluminum plate. Hand-laid fiberglass reinforces with longitudinal and transverse stiffeners. Interiors are in glossy cherrywood. The swim platform is fitted in way of transom. The superstructure is in aluminum-reinforced fiberglass. Bow area: sun-pad with two simple cushions, hatch (communicating with underlying cabin), anchor windlass with stainless steel chock. Lifeline is high and safe and surrounds the bow. Cockpit: large cockpit designed as the cockpit of deep sea fishing boats, with high bulwarks, rod holders, spacious lockers under the cockpit flooring and ample afterpeak. Stainless steel reinforcement with mooring winch and bitt starboard aft; a ladder connects the cockpit to the flying bridge and three steps on both sides of the cockpit take to the side decks, aft a fiberglass closing port connects the cockpit to the aft platform. 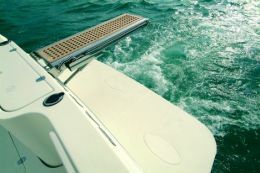 Aft platform: the aft fiberglass platform is fixed and quite large for a 38 footer, it is fitted with a swimming ladder concealed when not in use. Helm station: the helm station is on the flying bridge. It appears as a car's dashboard with walnut inlays and flush Raymarine and Volvo Penta instruments. The GPS and multifunctional instruments occupy most of the dashboard. Standard instruments include Raymarine C80 with GPS, chart-plotter and depth-sounder, ST60 with indication of speed, temperature and depth and Ray 215 Vhf radio. The pilot and co-pilot chairs have armrests and are adjustable. Layout and characteristics: direct access to the salon from the large glass door. The galley is to port. It is fitted with cabinets on its sides, Karadon counter with sink, ceramic hobs, refrigerator with freezer and many closets for storing kitchenware and serving as pantry. 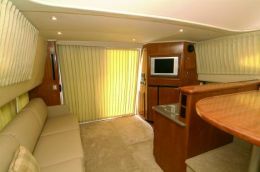 A TV set is mounted on the slanting bulkhead facing the sofa, to starboard of the companionway. 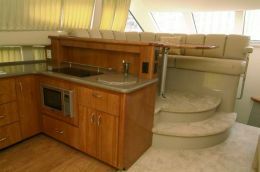 Forward of the galley there is the dinette with a leaf- shaped table and a sofa on two sides. To starboard a ladder takes down to the cabins. The master cabin with en suite bathroom is forward, the guest cabin is aft and is fitted sideways; the en suite bathroom is in the middle and is fitted with a second door accessible from the corridor at the bottom of the ladder. 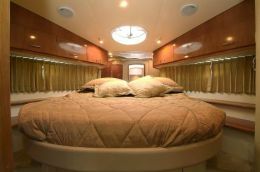 Standard fittings: 32,000 BTU split system air conditioning with inverter cooling two zones, cherrywood finishing, radio and CD player in the salon, 7.3 kW generating set, water heater, 3 ceramic hobs, refrigerator with freezer, live well and hot/cold water shower in cockpit. 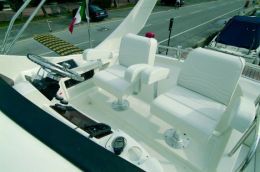 Optional fittings: teak in cockpit and aft platform, gangway, autopilot, fishing package, DVD and video system in salon and in master cabin, Bimini top for partial or total protection. Maximum speed at 3,550 rpm's: 29 knots. Helm station: the helm station is comfortable, the pilot seat is adjustable and the distance between pilot seat, wheel and control levers is good. Deck: the layout is good except that the side decks are quite small and the lifeline is low. The cockpit is sizeable and may be used for any marine activity. The flying bridge, which can be shaded by a folding Bimini top, is quite comfortable. Interiors: the dinette is ample, airy and bright thanks to the large windshield, to the side windows and the aft sliding door. Interiors are suitably designed to save space, e.g. the LCD TV set is mounted behind a panel for its ideal adjustment. The sofa is large and comfortable. The idea of raising the dining table and the sofa that lines two of its sides is excellent, but closets and lockers are scarce. 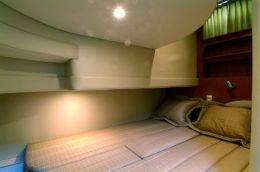 Passengers' comfort: in general, living onboard is pleasant and comfortable even in case of medium-range cruises. This comfort is favored by the air conditioning and heating system and the hi-fi system fitted in all rooms and common spaces. Galley: fully fitted and secluded and for a boat of this size it even includes a refrigerator with freezer like the one at home. Bathroom: the bathroom with two access doors, one from the master cabin and the other one from the hallway, is sizeable and well fitted. Engine room: a visual check of the engine is easily made by opening a port in the salon. For maintenance operations, the different floorboards may be removed so that only the longitudinal frames are visible. Sound-proofing is good. Electrical switchboard and plants: the two switchboards, 220V and 12V, are fitted at the entrance of the dinette, they are simple but appropriate.